Looks like HD-DVD is losing ground. Historically, HD-DVD players have cost less than Blu-Ray players giving HD-DVD the early lead, but now that Blu-Ray players have dropped in price, actual content is starting to dictate sales. Many of you know first hand that AVS Forum is first and foremost a site dedicated to helping others get the best out of the equipment they own. We promote the in home audio and video experience. People helping people. With that said, we are sad to say that this is only the second time in the history of AVS Forum where we needed to close down some sections of the site for a short time. 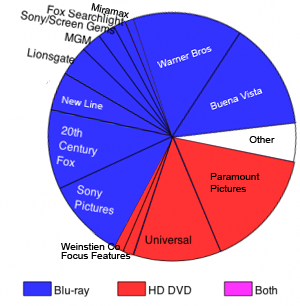 In this case, it is the HD format areas for HD DVD and Blu-ray which will be closed to new posts.